I am about to use a word I thought never to utter in reference to a "Glee" season premiere: "Meh." First of all, I almost forgot the show was coming back, as these days it appears to be all "X Factor" all the time over at Fox. But when I tuned in, I at least expected to feel some excitement that summertime was over and class was back in session at McKinley High. Everything is still pretty much status quo, except Sam is gone so Mercedes is dating a very large football player, Quinn has gone goth, Will and Emma are living together and Blaine has transferred in to be closer to Kurt. Only the final item got me to pay attention. 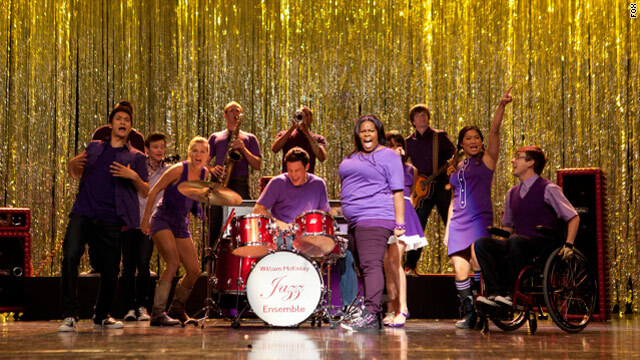 The plot line was all about how the glee club needed new members, and to that end, they staged a massive performance of the Go Gos' "We Got The Beat" in the cafeteria. It didn't at all impress their fellow students, and I was right there with them, almost tossing a handful of my own chips at the TV screen in solidarity. There were a few bright spots: Blaine's rendition of the Tom Jones hit "It's Not Unusual" which had Santana all over him (I smell trouble this season coming her way); Emma misunderstanding Kurt and Rachel's "big announcement" and attempting to hand them a pamphlet titled "Me and My Hag"'; That pair's delightful rendition of "Ding-Dong, The Witch Is Dead"; and the appearance of new student Sugar Motto, who has a horrible voice and "self-diagnosed Asperger's syndrome." But the best moment of the night went to 'The Glee Project" finalist Lindsay Pearce, who brought the roof down with her version of "Anything Goes." She was like Rachel on steroids with her pushiness and assertion that she's been working since she was a fetus (her sonogram appeared on an episode of "Murder, She Wrote"). Loved. Her. Perhaps it was the freshness of Pearce that reminded me of "Glee's" days of old, but I can only hope the show gets better from this point. I miss cheering for the loveable losers who currently just seem whiny and desperate to me. Co-creator Ryan Murphy told TV Guide he's very pleased with the new team of writers he's brought in. "We hired people who will read scenes and scripts and go, 'We can do better, let's change that.' Like, they'll literally say, 'You know what? We don't wanna do that with Mercedes. No one wants to f-ing see that,'" he said. Let's just hope they have better on tap than what was offered on Tuesday night. Hulu put a hold on watching it so I can't see it until, well probably now! Booo! "Oh they whine too much" "oh its to much talk of gey" a. they're TEENAGERS in the show, i dont know any teenagers that don't whine 90% of the frickin time. b. gey is a HUGE issue (sadly) that YEAH maybe they are trying to bring to the forefront as an attempt to normalise it. I'm sure if there was a d-bag on the show running around always talking about his love of "honeys, chicks, etc" no one would say a thing about it. The people who post comments like that are closeminded scared little children. FACT: just because they are gey doesnt mean they want to touch your nasty junk, they (like 99% of the female population including myself) find you repulsive. @cookie- EXACTLY! At the very mention of the word gey they jump on the defense, like they feel the need to protect and exact their manliness. In reality it does the opposite, it just makes them look like stupid, weak boys. Trust boys, they want you about as much as you want them… by the amount of protesting on here though… doth the ladies protest TOO much? Someone turned that wheelchair kid gay, but that was because he couldn't run away when they gayed him. It seems that the permiere episode will set up some potentially interesting scenarios for the rest of the season. It reminded me of the same energy I saw in season one. Very few shows do well in Season Two. The truth is they are just getting started for the year and this one is going to be far better than the last. The writing is better and there were some lines that were very funny and very good. Listen for them the next time instead of finding reasons to hate. Glee is just a smelly pile of steaming horse apples. CRASH AND BURN!! For those of you complaining that the show was "boring" or "meh" need to remember that there are 21 more friggin episodes of the season to go "crazy" on. They were setting the bar so they can go above and beyond later on. Are you the same ones who complained last year that the show had become "too big" and "over the top"? I thought the premiere was brilliant, just what I wanted. It reminded me of season one... the right amount of comedy, drama, and great performances (my favorite was Blaine's "It's Not Unusual"). Just sit back, relax, and enjoy the ride! Look at wheelchair boy sniffing that girls smelly, hairy armpits. I can't wait for this show to get cancelled. Normally I wouldn't say that about a show, but I'm sick of hearing about Glee. If I didn't hear about it, I wouldn't care. Since I have to hear about it, it annoys me. Also, I like the idea of Gwyneth Paltrow having one less job. Thank GOD. Last years Glee jumped the shark and thats all she wrote. The GleeGoober is now a limp noodle. Last night's Glee episode wasn't just "meh." It was ABYSMAL! While I had hope that it could recover some from last year's tumble, I was sorely disappointed in the premier. Right after "We Got the Beat," I turned the TV off and did something else. While I always enjoyed the music, I couldn't keep suffering through the horrible plot. It was bad enough that I had to watch 20 minutes of whining and crap just for a mediocre musical number. So, I will not be tuning in this year. It just seems to me that this show has run its course. You turned it off way too early. A lot of it harkened back to season one, and overall, it was enjoyable. I think it is funny that so many people become haters because it is the "in" thing to do. more typical liberal propaganda that being gay is somehow hip. When will we see the "Glee" episode where all of the members get beaten up at lunch for being annoying? You must've mistaken this for the "Whiny Bigoted Troll Forum.". That's down the hall and to the right just after the "People who Always Talk about Poop Forum." Somebody already put that kid, Timmy, in a wheelchair, but I suspect the fat black girl just sat on his legs when she found out he's gay. I am not with the commenter on the liberal blah blah blah blah...but I have to say, as a TV watcher, I am getting sick of seeing something with Kurt, his feelings or his clothes or whatever gay thing they can talk about in every episode. I know so many gay people that don't constantly talk about being gay literally every minute. I am cool with the lifestyle...it doesnt change my life 1%...but lets move on to some other things. i wasn't completely wowed by the premier either, but i think it's a bit unfair to expect to be blown away by every episode of any show. it's the senior year for a bunch of the characters, so i'm sure there will be tons of big moments and memorable episodes. all in all, i was pleased with the episode considering how many characters they have to cover, at least they showed you glimpses of what's to come from everyone.